I got to hear, speak to and shake Mark Bittman’s hand yesterday. He spoke at Powell’s Books in Portland. He’s written many wonderful cookbooks and writes the weekly Minimalist Column in the New York Times. He has a new cookbook out but spent very little time talking about the book. What he did talk about (and why many of us might want to get the book) is the pure and simple need for more people to cook more often; for all of us to eat more plants and less processed junk and fewer animal products. The wonderful thing about Mark is that he’s not preaching any particular diet. What he is preaching is that in order to keep our good, green earth alive and green and good and able to sustain its inhabitants we need to do things differently. 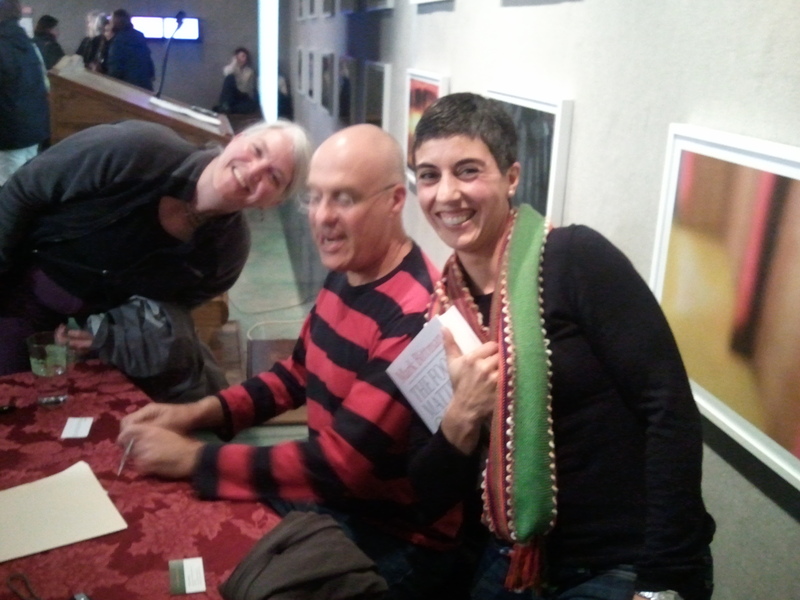 Me (on the right) with fellow Food Blogger Kathleen Bauer and Mark Bittman. Could I have a bigger grin on my face?! Many of us may already be doing what he advocates but he calls all of us to action nevertheless because caring for our own families is great and critical but not enough. I won’t recount all of the statistics he presented last night be let’s just say that a very small percentage of meals consumed in America are made from scratch and include unprocessed vegetables and that a great many people (children included!) are getting very sick from processed foods and our planet is paying an equivalent price. He also makes a very clear point on the role of government in food. He says that government is subsidizing corporations and should be subsidizing us, people! So he calls for a mass movement of folks to talk about subsidizing good food in school, vegetables, fruits. . .. instead of soy and corn and pesticides and fertilizers. And when the resources go to people rather than industrial food, well then maybe organic vegetables or just good, fresh vegetables and fruits will be readily available in all neighborhoods and for all kinds of folks, not just those with easy access to farmers’ markets, well-stocked grocery stores and a bit more cash. And then there’s a huge need to teach people what do with all the wonderful, fresh food. . . .
Now how is this inspiring? Well that latter part is where I come in and where we might all come in. There is such a need for better access to good food, better food in schools, better skills in the kitchen. And talking about food, while the statistics are depressing and horrifying, can and often is really fun, unifying and community-building. We all have to eat, most of us like to do so, and we all have our favorite memories, stories, flavors, associations. So I’m inspired to use these statistics to focus on all the good stuff we can be doing with food and with our families and how to make this even more part of our regular, daily lives. And I’m inspired to do more work on the political front to help shift the way our tax dollars are spent. And I’m inspired because Mark Bittman articulated in 45 minutes what Slow Food USA (of which I am a board member) has just spent 8-months articulating in the form of our strategic plan. When I said this to him he said: “It’s taken me 20 years!” So it’s nice to know that someone of his stature and influence is on the same path and that we, Slow Food, and many other local and national organizations, have a huge role to play in helping people find ways to improve our food system, our health, our planet. Thanks for reading and happy cooking! Very inspiring Katherine! I feel like I got to hear him myself. Thank you. Wonderful post, Katherine! Thanks for reminding us that access to healthy food is a political issue and one worth fighting for. I’ve been encouraged to see our school district moving in the right direction- connecting with local farmers and ranchers and preparing more food in-house. I’m so bummed that I missed this! I have his new book and am just in love with it. Did you recruit him for the SF board? I had intended an entirely different comment, but could not agree more with Carla that access to clean food, and water, is a vital political issue. Katherine, it is Mark Bittman who should be proud to have met two of the best cooks and writers in Portland. The cooking class that I was so fortunate to have taken from you was revelatory. I went home with so much more than a full stomach and a bunch of great recipes. Just watching you manage your kitchen with control and enthusiasm was a joy. Thank you Carol! I may have to quote you for my as of-yet-non-existant marketing materials! Just finished another class. Think they’re just as inspiring for me as for the folks who come.